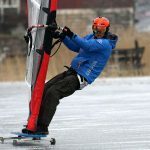 Naish Grand Prix is a modern Freerace board. In the past, manufacturers tended to produce freerace boards that were direct replicas of their team riders racing boards. The problem was that the team rides often weighed significantly more than Average Joe, not to mention the difference in driving skills. 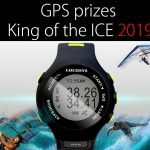 Naish Grand Prix is designed for the average freeride/freerace sailor with a clear focus on speed and maneuverability, performance that is relatively easy to unlock. 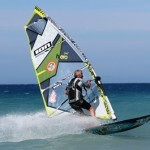 The Grand Prix is one of the fastest boards within the freerace segment especially when it comes to rough conditions. The Naish Grand Prix comes with a Naish Eco board bag and a Grand Prix 38 G10 CNC fin . Shaped by Richard Greene, the Naish Grand Prix 110 is designed to deliver slalom performance for all riders, based on the idea that a board which is easy and comfortable to sail will be faster. The hull shape features a subtle single concave into a flat vee in the tail, with small cut-outs. The Naish Grand Prix is early to plane and accelerates very quickly. The Grand Prix is a very quick and comfortable board on all points of sail, especially on flatter water. The single concave hull skips rapidly across the chop and it’s only when it gets really rough that the Naish Grand Prix becomes a slight hand full. for high-speed exits. 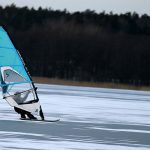 On flat water it carves beautifully and you can really lay it down into full speed carves, it does however, require a little more commitement from the rider in rougher conditions. 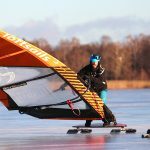 The Naish Grand Prix 110 is a really fun and exciting board to sail. As soon as you step on, the Naish Grand Prix has a great sensation of frictionless speed as it skims across the water with a much less planted ride than many of the other boards. 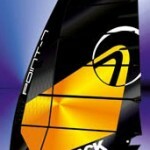 Despite its lively ride the Naish Grand Prix is in fact very controlled and easy to sail at speed. On flat water the Naish Grand Prix was one of the fastest boards in the group, and in chop it was even faster. Occasionally we encountered spin-out, and when this happens it’s extremely difficult to recover it without slowing right down. Luckily this doesn’t happen often. 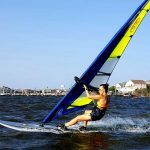 The Naish Grand Prix is good at planing through the lulls, but does lack a bit of drive, particularly upwind when underpowered. In lighter winds you could invest in a bigger fin to get even more out of this board (if you plan using much bigger than a 7.0 sail on it). 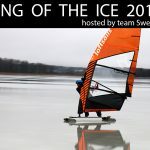 In the gybes the Naish Grand Prix is great. 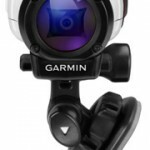 It’s very smooth, agile and lets you readjust your arc with ease mid-turn. Best suits a broad range of sailor sizes who want slalom speed but are working on slalom skills. In a fleet built for speed, this Naish kept up with the pack and often leaped ahead around the marks, where the Naish Grand Prix jibing powers clearly shined through.